Have you ever wondered what the length of a nanosecond in circuitry looks like? My new favorite human, Rear Admiral "Amazing" Grace Hopper, did when the technology of her time began to become more sophisticated. A curious child, Grace was born with "the knack" and would constantly be found by her mother dismantling things around the house just to see how they worked. Back then, she probably never suspected how important her tinkering would become as a pioneer in computer science. Grace went on to attend Vassar College and graduated with a degree in mathematics and physics. She attended Yale for her master's and also earned her Ph.D. in mathematics there. At 37, Hopper quit her day job as a professor to join the Navy. Years later, a young David Letterman would ask the Rear Admiral what interested her about going into the Navy so late in life; Grace responded with sass and patriotism, "Well, World War Two, to begin with." Let's not forget, before she joined the Navy, Grace was a teacher and continued to teach up until her passing in 1992. She always carried around her "Nanoseconds" to offer a quick lesson and a souvenir to any curious passersby. Today, Grace's "Nanosecond" is displayed at the US Naval Academy where thousands of Naval Officers walk by it every day as they go to their science courses. 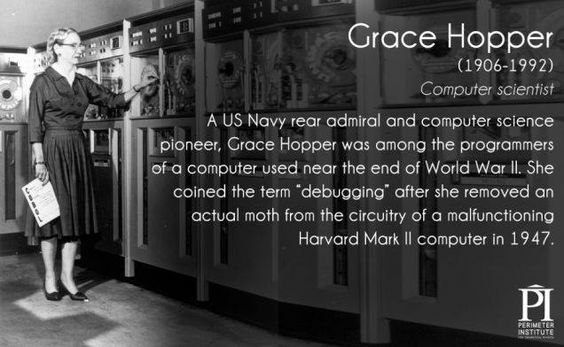 Click here to watch the Fascinating Story of Grace Hopper [2:17].